Get wild in the heart of Africa, with the iconic Victoria falls at your doorstep. Whether it’s for family fun or taking care of your business, the Victoria Falls offers contemporary comforts and uncontested convenience. Work, rest, stay and play in signature style for dazzling days and enchanting nights. 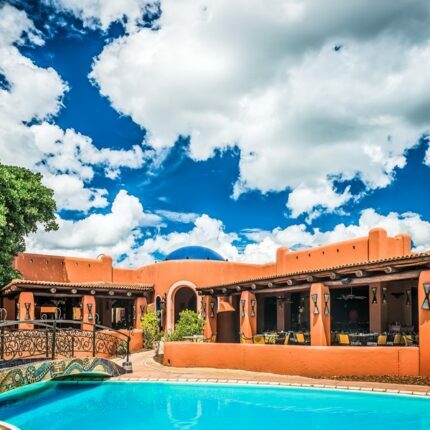 The Victoria Falls Resort is a high value getaway for families as well as a top conference destination – all within a five-minute walk of the Victoria Falls. Each of the 212 colourful rooms and suites features a complete range of essential amenities, contemporary design and WiFi access. 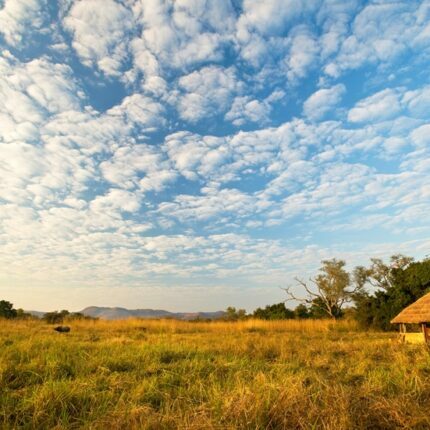 Busanga Bush Camp lies in the heart of the Busanga Plains, a vast mosaic of expansive grassy seasonal floodplains that extend to the horizon. When the mist rises off the floodplains as they dry up in winter, incredible sunrises and sunsets are experienced here, while the floodplains and dambos teem with wildlife and birds. The camp, nestled in a vegetated island of fig trees, can accommodate eight guests in four well-appointed tents. A special experience is an exclusive hot air balloon ride (August – October), ending with champagne breakfast. 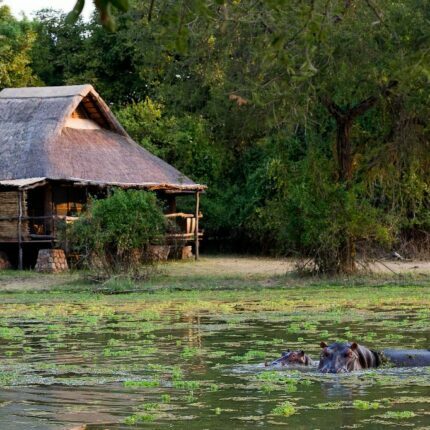 In an enviable location on the edge of a lagoon where hippo chortle and elephant wallow, stands Chindeni – undoubtedly one of the most beautiful tented camps in the South Luangwa. There’s something about sleeping under canvas that ignites a sense of adventure in everyone. At Chindeni you can combine that thrill with style and comfort in one of its four opulent tents. Gaze out from your private veranda onto the lagoon which attracts birds and animals from miles around. There’s something undeniably special about Kuyenda. Set beneath shady trees by the Manzi River, it may be the simplest of camps but Kuyenda embodies the authentic charm of old Africa with its cluster of traditional thatched grass huts and back-to-nature feel. With three twin-bedded rondavels (queen-size beds) and one double (king-sized bed) Kuyenda ideally takes six guests, however groups of eight are accepted. Forget infinity pools and wi-fi – Kuyenda is the quintessential classic African bushcamp, lovingly rebuilt each season. We love Mfuwe lodge! Each year at Mfuwe Lodge they have some very special guests paying them a visit. Families of elephants have been regular guests at the lodge for several years, visiting between late October and mid-December to feast on the fallen fruits from the large Wild Mango tree in the lodge grounds. Ease yourself into Luangwa life with a stay at the award-winning Mfuwe, the lodge’s allure is instantly obvious. Scattered along two lagoons’ shady banks lie 18 thatched chalets from which you can enjoy your own private piece of Africa. 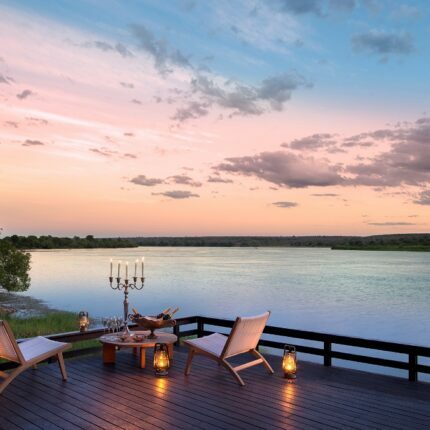 The one and only Relais & Châteaux property in Zambia, Royal Chundu, is situated on the banks of the mighty Zambezi River, overlooking the majestic river and surrounding bushveld. Be transferred by boat to Katombora Island, wrapped in the watery embrace of the Zambezi. With only four spacious villas on the island, Royal Chundu’s Island Lodge illuminates tranquility, exclusivity and privacy. 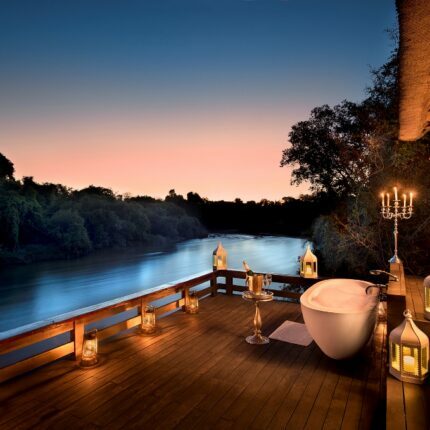 Refresh in the infinity pool and in the evenings, relax in a riverfront bathtub – the perfect romantic getaway. The lodge lies about an hour’s drive upstream of Victoria falls and offers a wide variety of activities including photographic river safaris, sunset cruises, birding safaris and picnics. Royal Chundu, the “meeting place of the Chief”, is a destination of absolute solitude and unspoiled beauty. Royal Chundu are proud to be the one and only Relais & Châteaux property in Zambia. This breathtaking lodge is situated on the banks of the mighty Zambezi River, overlooking the majestic river and surrounding bushveld. Incredibly, Royal Chundu is positioned on a piece of untamed Africa with rapids protecting it up and downstream. Royal Chundu River Lodge scatters 10 suites along the riverfront with wooden decks ensuring intimate and serene views accompanied by uninterrupted privacy. The sights and sounds of Africa serve to invigorate the senses and enhance the blissful solitude. The magnificent historic game lodge set in amongst lush primeval forest provides panoramic views across the game-rich valleys of South Luangwa National Park. On a magnificent hilltop location in the South Luangwa National Park, Sanctuary Chichele Presidential Lodge was once the personal retreat of Zambian President Kenneth Kaunda. In keeping with the grand colonial style of the lodge, the ten Victorian-style suites are decorated in the same understated elegance of years gone by – the ideal vantage point to relax and enjoy the wildlife. Perched on an escarpment overlooking a floodplain in the South Luangwa National Park, Sanctuary Puku Ridge Camp offers stunning vistas with perfect game sighting opportunities. Built on a hillside, it provides stunning vistas of the floodplain, the panoramic views of Sanctuary Puku Ridge Camp are astounding. Each of the seven safari tents has picture windows and its own viewing deck overlooking the plains where game amble across for a drink of water. Sanctuary Sussi & Chuma is built on a dramatic bend of the Zambezi River in the Mosi-Oa-Tunya National Park, 12km upstream from the world-famous Victoria Falls. Named after Dr. David Livingstone’s faithful friends Sussi and Chuma, the lodge is located in one of the most beautiful parts of the Zambezi amidst Jackalberry trees and Phoenix palms, providing unrivalled views and exclusivity. 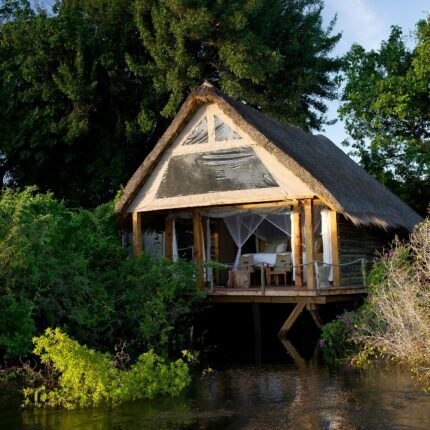 Accommodation is in twelve Sussi tree-houses, connected by wooden walkways and two private Chuma houses, each with two bedrooms. 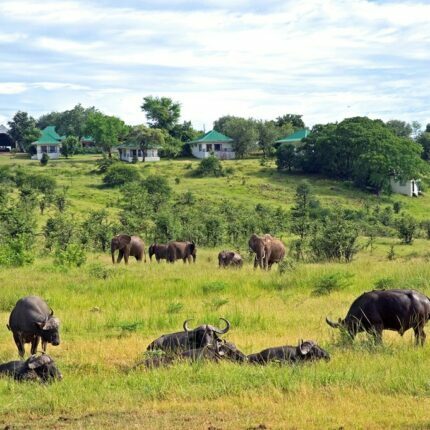 Shumba Camp is situated in the centre of the Busanga Plains close to permanent water and within easy access of the teeming floodplains. Shumba is named after a favourite species in the area: its large prides of lion that are often seen right next to camp – or even, unusually, in trees. Viewing of this and other species is possible from the comfort of the tent or main deck, while the camp’s fig trees ensure both shade and constant bird activity. 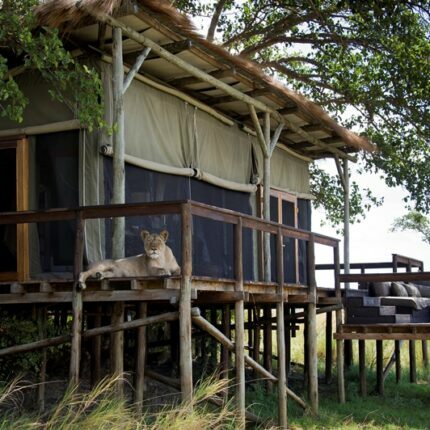 Shumba Camp comprises six spacious luxury safari tents, all on raised platforms with spectacular views. Sindabezi Island is unique – the discerning traveller’s best kept secret. 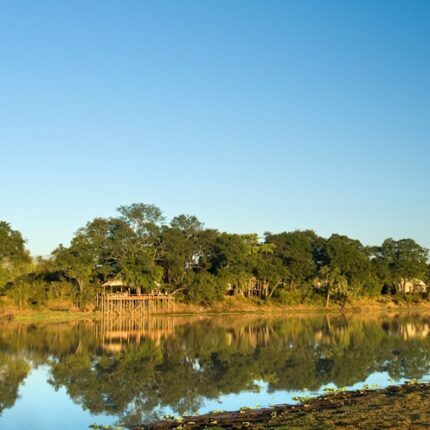 An idyllic, exclusive camp on its very own private isle on the Zambezi River. 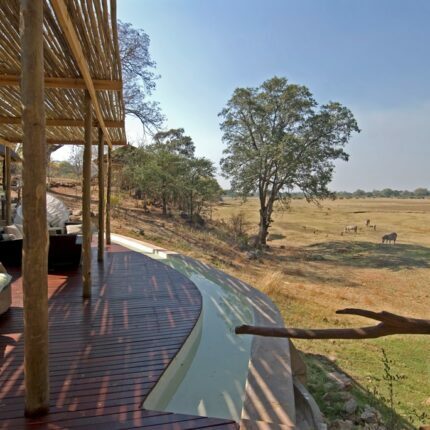 It is the only luxury bush camp from where Victoria Falls can comfortably be explored. 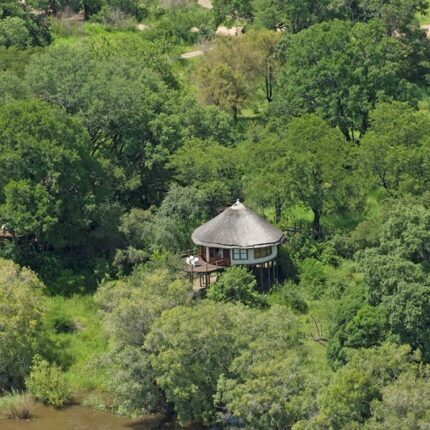 Sindabezi has only five open-sided thatched cottages, built on stilts above the Zambezi River, allowing guests to soak up the sights and sounds of the African bush in the perfect, pristine setting. 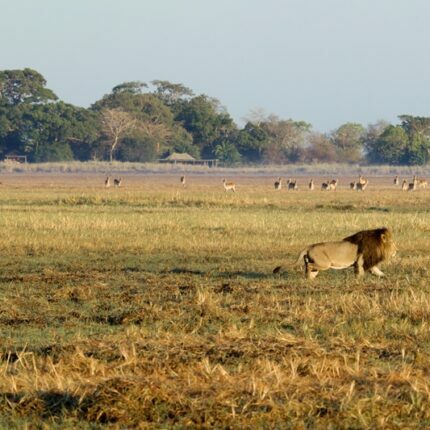 Views across the flood plains of the Zambezi and into the nearby National Park complete the experience.